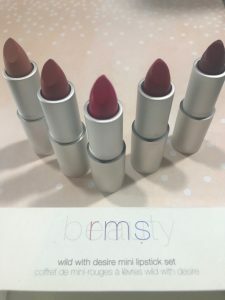 RMS Limited Edition: Wild With Desire Mini Lipstick Set. Organic, Non- GMO, Non- Nano, Soy Free, Gluten Free, Cruelty Free. I love these lipsticks for my clients and on commercials when looking for a great selection of colors! They go on so nice and hydrating, but also have a long- wearing ability. Love the products from RMS, as they are a much cleaner brand that cares about our health and beauty. RMS was created by a makeup artist who gets what is needed in a lipstick, but also caring about the ingredients in her products! These are limited edition…so not sure how long they will be available for. 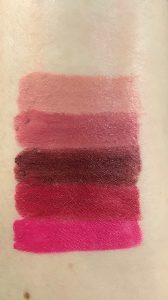 These are smaller tubes, but they are good for trial uses and are very pigmented while offering you the option of trying this brand. They have a good range of colors for all skin tones. I highly recommend these!